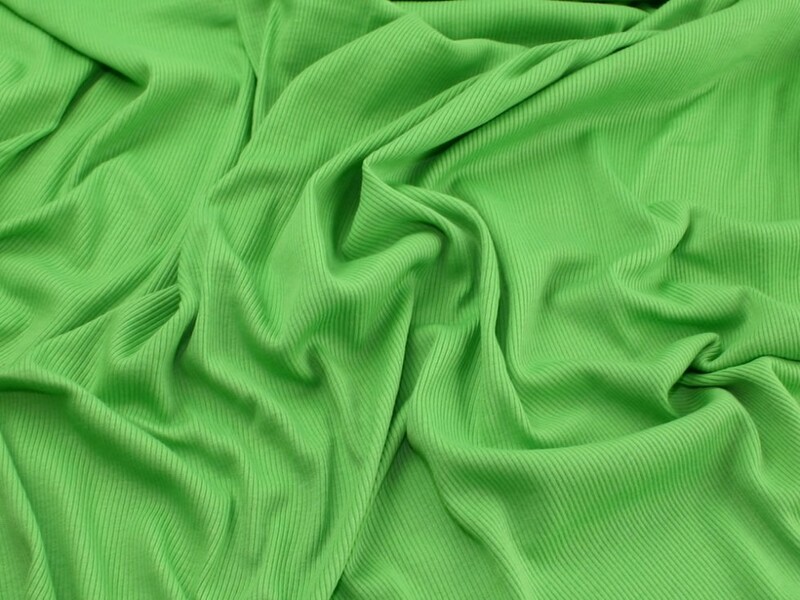 A lovely quality cotton blend stretch jersey fabric with a ribbed texture. This fabric has a quite a lot of stretch and is a medium weight which would be lovely for making summer dresses, skirts, tops and more. It is also suitable to use as a ribbing detail on cuffs and neckbands. We recommend sewing this fabric with a ballpoint or stretch needle to avoid skipping stitches. As part of our clearance range we are able to bring it to you at a much cheaper price than the RRP, but only whilst stocks last! Please note, each colour in this range of rib jersey fabric varies slightly in weight, feel and finish. The widths may also vary, the width stated is the average width taken from all stock. Please order samples if you are unsure. Bought the black and navy to make some tops. Both very very nice but slightly different (the navy was a bit thicker). Made two tops that were both nice to sew and have held up in three washes so far. Good thing about this fabric is I can use the scraps for cuffs and be neckbands so nothing is wasted. Lighter than the Green Pastel. This has a very good stretch. Personally I dont think it is cotton blend as it feels a bit rough.. Nice colour and stretch. Pastel Green has no stretch, and is quite thick and different quality compared to the Rose Pink. I dont think it is cotton blend, doesnt have the softness, will be returning these. Lovely colour though. Seeing as this is described as "suitable to use as a ribbing detail on cuffs and neckbands", I was expecting the black to be thicker. Holding it up, you can almost see through it - that's not what I would expect for ribbing on cuffs. However, it is very stretchy and I have ended up using it for the cuffs and waistband on a hoodie (as I really need to get on and make my project, as it's a gift)... I'm just not convinced it will hold out to repeated wear. I also bought the Silver Grey, and that is the same thickness as the black.... if I was using it to make a summer dress (as suggested in the description), I'd be worried it'd end up too see-through! Bought the black fabric, sadly it is some weird synthetic fabric, with a chemically smell when pressing and incredibly thin and light weight, making it completely unsuitable for the project I started making it with. NOT cotton and definitely not medium weight.